Meal 6 in week 9! I actually cooked this on Saturday right after the farmers market, having come home with my head full of ideas thanks to the kind folks at North Star Orchard. You see, I was gushing over how pretty the rainbow chard was and how versatile the leafy green is since it’s the best of celery and spinach in one plant, plus, THOSE COLORS. We chatted for a bit about the myriad of ways to use this gem of a plant, and how great is it that farmers take the time to extol the virtues of their vegetables and offer recipe ideas and cooking advice?! 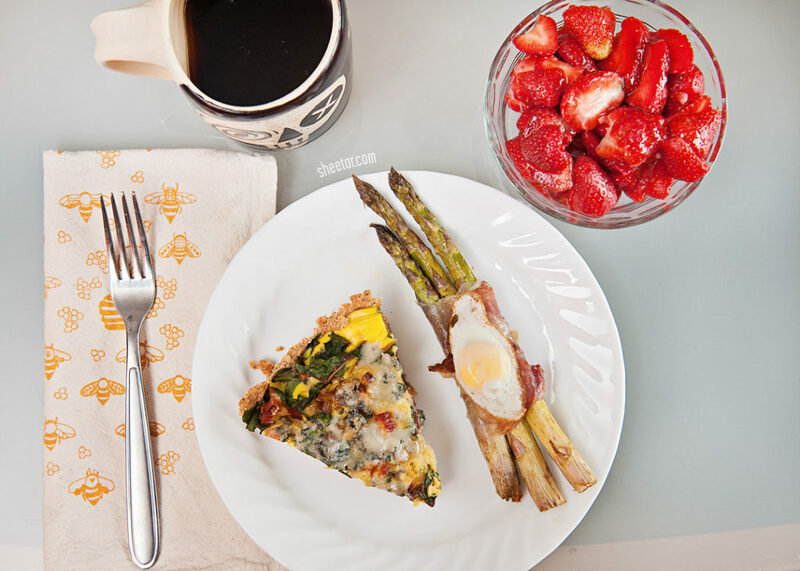 Well, a quiche is just one of the ways to use chard, so the second I got home, I set out to make a late breakfast for myself. I like using recipes since I need a good guide when I cook, so I found this one that included a cornmeal and flour crust for the quiche. I replaced the shortening with lard, because lard, and again instead of milk, I used goat’s milk yogurt. Chard replaced the spinach, and I sautéed the chopped stems with spring garlic, garlic scapes, and scallions. Instead of swiss cheese, I used blue cheese fresh from my first Collective Creamery cheese CSA pickup. I cheated a little and just pressed the crust into the pie dish instead of rolling it out, saving myself the trouble of washing the rolling pin and mat, but that worked out just fine since the crust came out nice and crispy, and the dark roasted cornmeal I used kicked the flavor of the whole thing up a notch. On the side are three asparagus spears wrapped in culatello, topped with a bit of Red Cat cheese (because always cheese), and a wee little fried quail egg. The bowl in the back contains fresh strawberries drizzled with our own honey, and I’m not ashamed to say I polished off a whole pint of strawberries in one sitting because they were FANTASTIC. There’s also a mug of non-local (but absolutely necessary) cold brew coffee. I also now have a whole bunch of quiche leftovers, so there’s breakfast for the week! See, I knew I was going to get behind on these, so while this is meal 4, it’s technically week 7. Things have been a bit crazy, so while I haven’t had time to put together exclusively local meals, most of what I eat while the farmers market is in full swing ends up being local since that’s where I do the majority of my grocery shopping. Anyway! This is a bit of an ambitious dinner for me, but it’s a pretty awesome one, if I do say so myself. The centerpiece is the banh bao, a Vietnamese pork bun. 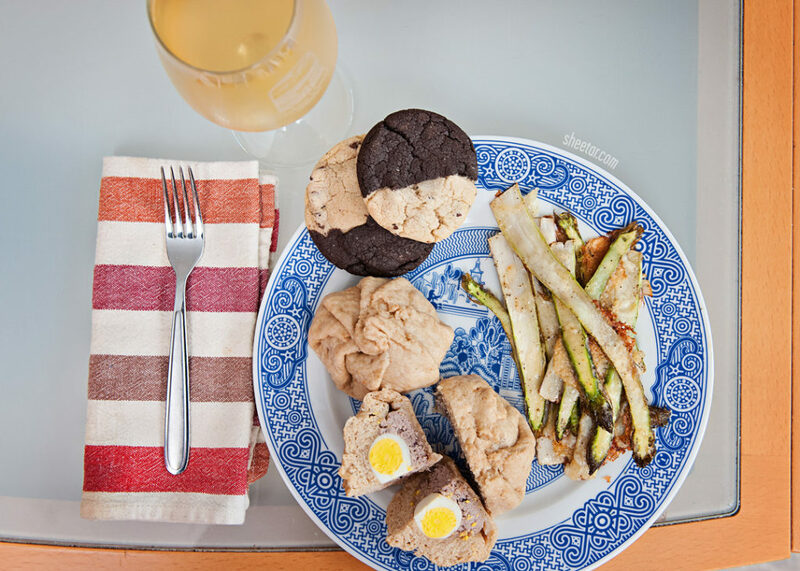 Husband came across these on his travels for work at one point or another and we figured the recipe had to be fairly easy – meat and a hard-boiled egg in a dough wrapper. We found a recipe online and made a huge batch a few years ago. They freeze and reheat surprisingly well, but it definitely is quicker work with two people. For this version, I made my own self-rising flour using the ratio here, making a 3 cup batch of flour. The original recipe calls for milk and sugar, so I substituted in 1/2 cup honey and 1 cup of goat’s milk yogurt to keep it local. My flour is also a whole wheat flour, so they didn’t come out perfectly white like the traditional banh bao, but that’s just cosmetic anyway. The filling consists of a hard-boiled quail egg, scallions, and ground pork. I even took half the batch and added a few cheese curds just for fun. The quail eggs are a new offering from our farmers market poultry vendor this year, and it’s neat to be able to use quail eggs instead of quartering a chicken egg. The poultry vendor’s two girls are raising the quail and running the whole quail egg operation on their own, so supporting the next generation of farmers as well as two young girl entrepreneurs sweetens the deal! Going around the plate, next we have sliced, roasted cheesy asparagus. I picked the bigger asparagus lot at the market, sliced them on a mandoline slicer, then tossed them with olive oil, salt, and pepper and topped with cheese. Into the oven at 425 for about 8-10 minutes, and voila! The cookies may not be made with local ingredients, but they are from a farmers market baker. Supporting local business is part of the One Local Summer equation, so while it’s a bit of a cheat, it’s chocolate chip cookies, how could I not? In the glass is some more homebrewed mead to finish out the meal. It may not be the world’s most exciting meal, but it’s classic Chez Sheetar comfort food – meat and potatoes. It was a quick and easy meal to make in the oven in one pan, and I get to show off the peach jam I made! Our single little peach tree yielded quite the harvest this year, so I was able to do two batches of jam, a run of canned peaches, and even froze two bags of skinned and pitted peaches for pies over the winter. Of course, the squirrels got a fair share of the peaches too, but it’s no big deal since there were SO many. 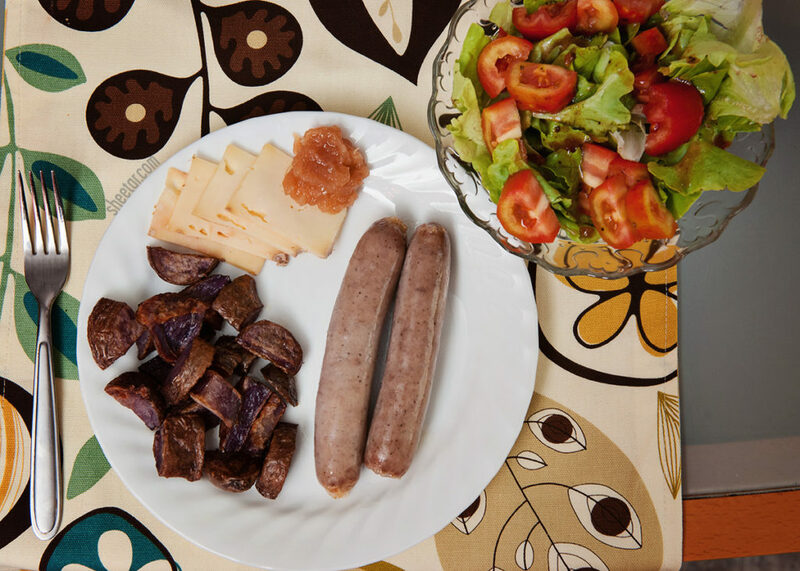 Anyway, the meal is kielbasa with potatoes plus a small salad and some cheese and jam. The cheese is Birchrun Hills’ Red Cat that was washed in Tired Hands beer and it was OH SO DELICIOUS with the jam. It actually made for a nice little dessert! Yep, still playing catch-up. It should be week 15 as I’m posting this, so I’m still behind. Life just keeps getting away from me and the first thing to go when things get to be too much is cooking. But hey, I’m still here making the effort, and I have to wonder if I’d even bother cooking at all if it weren’t for this challenge! 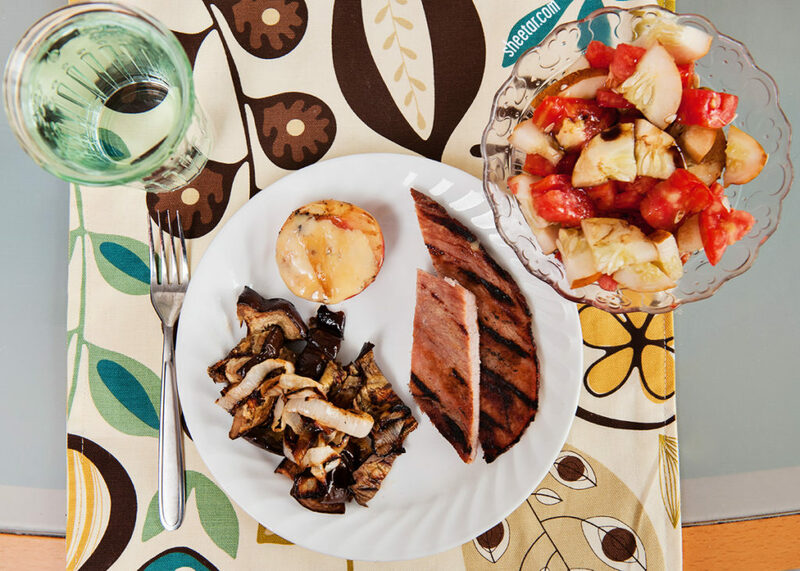 So, this meal was a ham steak with grilled onions and eggplant and a cucumber and tomato salad on the side. Everything was cooked on the grill, so it was great to not have to heat up the house on a day that was already too hot to begin with! I may have ever so slightly overcooked the ham steak, but it was still delicious since it was given a little rub down with our own honey before it was introduced to the grill. I need to remind myself that I don’t have to be fancy, and it’s okay to slap meat and veggies on the grill and thats good enough (and better than a microwaved boxed dinner).